Fiction Friday: Chapter 12 – The Bookshelf of Emily J. It has been five months since Walt’s stroke. Christmas time is already approaching. Leda does not know if she should put up their tree, a plastic, pre-lit decoration of convenience she found at Kmart a decade ago. Walt now talks a little and has alluded with a few grunted words to his desire to see the house decorated. Leda wants to please him, but the energy it would take to accomplish all of that decorating feels as if it has already been spent on caring for Walt. She decides to have her grandsons put up the tree for her, then maybe she will feel like putting on the ornaments. Maybe she can put Walt into his wheelchair to watch. This could possibly be a bonding moment for them, one in which Walt will be able to participate and they will be able to laugh at old times, remembering Christmases past and the ornaments their children made at school then brought home as gifts to Walt and Leda. Leda decides that Christmas could be a good thing. There might be a healing power in the holiday season, although she hasn’t felt that in a long time. Christmas has turned into a chore, a time when she must work and cook and work some more. A time when she must either buy a present for all of her grandchildren or make sure she sends them all the same amount of money. Sometimes she forgets somebody and then feelings are hurt. Christmas had become mundane and stressful. Why can’t it be like it was in the past? Soledad won a Christmas tree at school. Every year, their elementary held a raffle for a tree. Each year, either Mary, Isabella, Josefa, Maria, Manuel, or Raymond won it. This year Soledad had won the prize. She carries the tree proudly from the school to the bus stop, shoving it through the glass doors and up the narrow, rubber-padded stairs. The bus driver grins with the spirit of Christmas, even getting up to help small Soledad maneuver the prickly evergreen into a seat. The bus driver tells her to leave it on one seat and sit on another, but Soledad is too proud for this. She sits right next to her tree, hugging it the best she can and carelessly brushing its needles from her face and hair. The syrupy pine scent fills the bus, and when Leda gets home she is covered with sap. Pilar laughs gaily, acting astonished when the tree comes through the door with her small child. Pilar has figured out by now that the school has “rigged” the raffle, ensuring her fatherless children a tree for their Christmas celebration. The family pops corn that night, stringing it on fine thread and trimming the tree with yards and yards of it. There are also paper chains, some from school projects and others made from the paper the family has saved over the year. Occasionally, Auntie Chacha brings over the newspaper cartoons, which have now been made into colorful links, carefully pasted in place with a thick mixture of flour and water. Leda returns to the Christmas at hand, the one during which Walt will be sick and she will take care of him. She pushes thoughts of her happy although scanty childhood Christmases and shuffles to the garage. She plans to find the tree and decorations. Maybe she will pull the box containing her plastic tree into the house on her own. She could set it up today if she can get it inside. Mid-December has already arrived, with the milder winds from the San Francisco Bay blowing through the valley. The crisp, chilly air has inspired her. She suddenly wants to make Christmas special, even if their physical trials seem to be too much to handle this year. In the dark corner of the third bay, she finds the boxes carefully labeled “Christmas Decor.” She sees the large bulk of the tree package, its contents safely nestled in Styrofoam. She spots the box she knows contains ornaments and decides to work on that one first. She pulls it off the shelf, blowing a year’s layer of dust from the top. The particles create a small mushroom cloud, engulfing her face and causing a sneeze. She shakes her head, hoping to clear the air and her sinuses. Instead of carrying the box straight inside, she sits on the cold cement floor, somewhat oil-stained and sedimented. She pulls the box open, its flaps again making dust fly. She pulls through the contents, spotting old and new stockings, porcelain figurines portraying Jolly Old Saint Nick, and finally, the ornaments. She realizes that this box contains the older ornaments, the ones the children brought home from school or the ones she collected in her younger life. She had planned to get out the newer bulbs, the ones of blown glass and spun silk. Leda begins to fold the box up again, but a dash of red catches her eye. 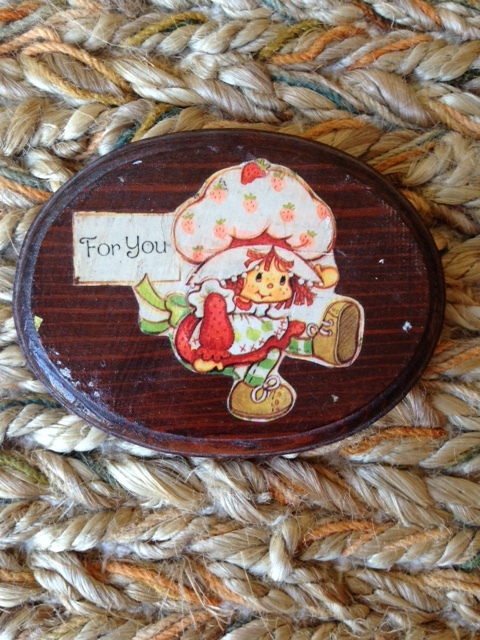 She sees a dark wooden plaque with a picture of Strawberry Shortcake shellacked to it, the loop for hanging made from the tab of a soda can. She realizes it is something Colleen made in her teenage years, something to cater to her nieces. Colleen was Leda’s youngest child, her beautiful and sensitive redhead, the one who doted on her older sisters’ children and who enjoyed being a young aunt. Colleen had made the plaque as a decoration to please the grandchildren, something to catch their eye when they came to visit at Grandma’s house. Leda realizes this is two years before their lives changed, two years before the drunk driver smashed into Colleen’s car on graduation night. The irony of that crash, that Colleen had been the designated driver for her friends and yet had been hit by a man smashed out of his mind on alcohol. Colleen did not drink, yet took care of her friends who did. Colleen was the only one who had died that night. The others escaped with broken legs, necks, and jaws. Colleen had lost her life. Leda lets the salty wetness course down her face. She finds herself rocking, holding the tiny plaque against her heart, wondering if she will ever see Colleen again. She wants to believe in life after death, but it seems so abstract, so unimaginable in the face of the pain she has suffered. She thinks of Walt, his suffering, and wonders if he will recover. She wants his body to continue to heal, but she cannot see much improvement. His face continues to be lopsided, his body unable to feel much at all. He has not regained control of his bodily functions, yet can lift one hand and maneuver the fingers with minimal skill. The physical therapy seems to be working, but is the pain worth all of that? Leda has often thought that the pain of losing Colleen would be better dealt with by dying herself. A piece of her died that night, when she got the call that her daughter had been killed. She went numb for days, going through the motions of picking a casket, arranging a funeral, and calling the family. She had even thought of protecting Janet, pregnant with her third child. Leda told her not to come to the funeral, just the viewing. She did not want the tragedy of their lives to lead to another tragedy, possibly a miscarriage in a grief-wracked body. Then, after the flowers had wilted and the friends had gone, Leda sank into herself. She spent days in bed, staring at the ceiling, watching The People’s Court, and sleeping. Mostly sleeping. Walt woke up earlier than ever for work, showering quickly and noiselessly leaving the house. She knew it was his way of dealing with the tragedy, of pretending that it hadn’t happened or, if it had, pretending that it did not affect him. She knew he cried in his truck on the way to work, for she found the empty Kleenex boxes and used tissues months later. She wished she had his strength to get out of bed, let out her grief, even if in private, and continue living. However, Leda couldn’t do this. Instead, she gave up what she loved most: painting. She had painted furiously over the years, decorating their home with oils on canvas. She mostly painted landscapes or flowers. She tried to recreate the idyllic scenes of her childhood in the Bay Area, the farms, orchards, and poppies. Now, that inspiration had fled. She gave her brushes and blank canvases to the Goodwill, then threw the half-used paints away. Leda realizes that it has been twenty years since that day, since her life fell out from under her. She stares at the Strawberry Shortcake image, so cheery and false in her brightness. Leda knows the world has fallen again and wonders if God has a sick sense of humor. She decides that she does not want to lose Walt, even if she still feels angry with him from time to time, even if their marriage has not been a perfect one. She does not want to lose him, too. She stands and tries to dust the dirt from her bottom. Her creased linen pants have become wrinkled, but she decides that it does not matter. Instead, she turns back to her task at hand. She is going to decorate for Christmas. It could be her last with Walt.